Cosetta Arzuffi was born in Zanica, Bergamo and is the daughter of art. She approaches to painting very young, first under the guidance of his father Arturo, musician, then atelier paternal uncle Pasquale Arzuffi that directs the classical composition. After the professional studies she attends figuratively drawing classes at the Marangoni Institute in Milan. She continues her artistic training under the guidance of Luigi Arzuffi and the painter Piero Urbani. She learned the art of engraving by the painter Ignazio Nicoli, also attended the ancient painting courses, painting and wood restoration. 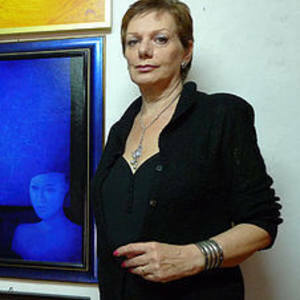 Since 1970 she participates in the artistic life with personal and collective exhibitions both in Italy and abroad. Since 1985 she dedicates to the research studies of light, color and symbolic expression of thought. In 1994, she was appointed for the three years from 1994 to 1997 full member of the diocesan commission for the Sacred Art of Bergamo. His works are in public and private collections in Italy, France, Switzerland, England, Holland, Belgium, Canada, Japan, Australia, Malawi, Israel (Jerusalem) and at M.A.C.S. (Museum of Art and Culture Of Sacred Lombardia- Roman Bergamo -Italy). Of you have written: Lino Lazzari, Federico Honnegger, Cesare Rota Nodari, Cristina Roots, Antonio De Santis, Ettore Sornaga, Giuseppe Sala, Sergio Tinaglia, Bruno Cassinelli, Luigi Cannizzaro, Silvana Galizzi, Saints Molino, Silvano Manco, John Berera, Lorenzo Geroldi.